Until recently, I had never been to a Trader Joe's. Unfortunately, we don't have one in my area. But, on a recent trip to Mt. Pleasant, South Carolina, I insisted that we visit the store. I wanted to know what it was all above. After all, there are cookbooks dedicated to the store so it must be something special. Trader Joe's was quite the store filled with unique prepared foods and groceries. My husband was just as intrigued as I was and threw a few things into the basket himself. I bought a cinnamon and sugar grinder that I've grown quite fond of and wish I would have bought in bulk. Another reason I felt compelled to go to Trader Joe's was because I knew I would be reviewing Kelly Lester's Cooking with Trader Joe's Cookbook: Easy Lunch Boxes and I needed a point of reference. As I found out, while shopping at Trader Joe's is the perfect way to take advantage of this cookbook, you can still utilize this cookbook if you're like me and sadly live a Trader Joe's-free life. Kelly Lester is the inventor of the Easy Lunchbox System, containers that are a type of modern bento boxes. All of the lunch ideas in this cookbook are packaged in the Easy Lunchboxes. And, the lunch ideas are divided into fun categories such as: Pack It (Really) Fast!, Pack it Kid-Friendly!, Pack it Playful!, Pack it Yummy!, and Pack it for Work! There are also ideas for those of you with dietary restrictions: Pack it Veggie!, Pack it Vegan!, and Pack it Gluten-Free! The cookbook is brightly illustrated and filled with tempting full-color photographs and features short biographies of mothers and bloggers from around the country who share their food philosophies. This cookbook is great for those of you who need some new healthy and creative ideas for packing your kid's lunch (and your lunch, too). You'll never look at "brown-bagging" it again after reading Cooking with Trader Joe's Cookbook: Easy Lunch Boxes. 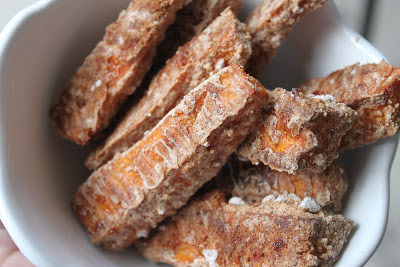 I chose to highlight a recipe that did not require a Trader Joe's product, Sweet Potato Graham Cracker French Toast "Sticks". Serve them with your favorite syrup. Preheat oven to 375 degrees and line a baking sheet with a Silpat liner, foil, or parchment paper (lining your sheet will save you immense headache in the cleanup process). Meanwhile, peel sweet potato, rinse with water, and slice into sticks no more than 1/2 inch wide (the length does not matter as much as the width). In a large bowl, beat an egg with a fork and place sweet potato sticks into egg mixture and toss to coat. In another large bowl, combine all dry ingredients and stir to create a dry rub. Grab a handful of egg-coated sweet potatoes and coat with dry rub, then place on prepared pan. Repeat with all remaining potatoes. If you have extra egg mixture or extra dry rub, sprinkle over top of sweet potatoes before baking. Bake potatoes for 30 minutes, then flip. They will likely have become stuck to the pan, so use a spatula to separate and flip over. Bake for additional 10-15 minutes until golden and crispy. Remove from oven and if potatoes are stuck together, either tear them apart with your hands after they've cooled a bit, of place on cutting board and slice. Serve with maple syrup for dipping if desired. Disclaimer: The author provided me with a copy of the cookbook; however, the opinion expressed here is my own.